Insight Observatory's Educational Image Request form for the Astronomical Telescopes for Educational Outreach (ATEO) is now available for use with classroom teachers and students. The staff at Insight Observatory would like to thank the Plymouth Public School District located in Plymouth, Massachusetts, for allowing a few of their classes to participate with a trial program utilizing the ATEO remote robotic imaging telescope integrated with the Educational Image Request form (EIR) for their astronomy research projects. 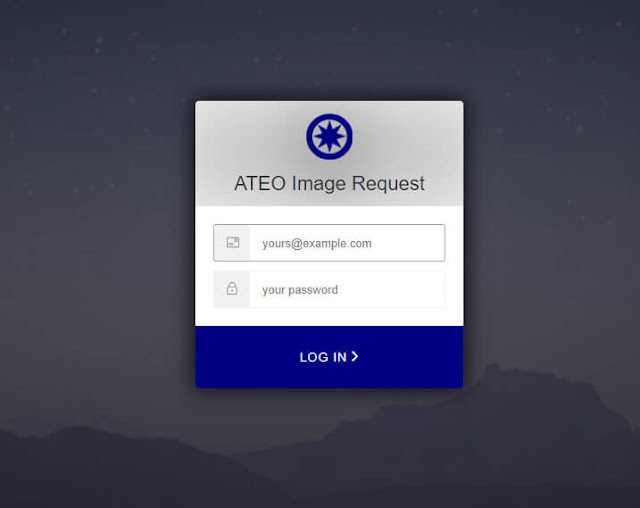 Secure login for access to the Insight Observatory ATEO Educational Image Request Form. The process begins with an account created by the teacher for their class. Once the account is created, credentials are created for the EIR form that each student in the class would use to access the form. When the students log into the EIR form, they are then prompted to enter their name followed by requesting a deep-sky astronomical object to image with the requested exposure parameters. There is a drop down set of user instructions for completing the form. When a deep-sky object is chosen, a message will appear confirming that the object is visible that night for imaging. Once the EIR form is submitted by the student, the class instructor receives a receipt of the student's request and the image request is then submitted in the remote imaging telescopes queue. 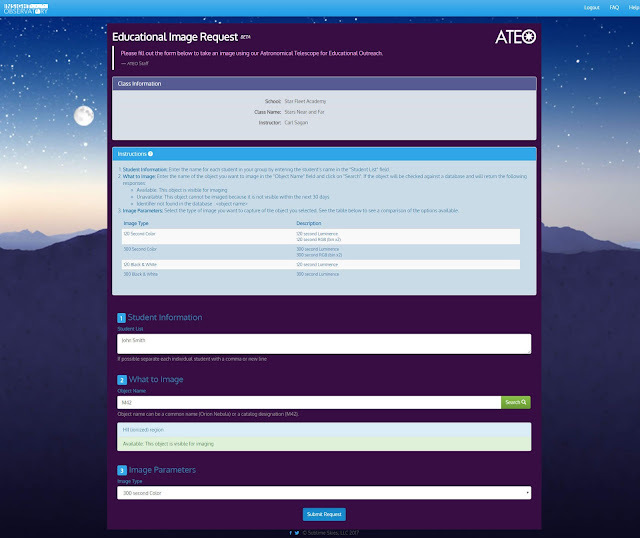 Screenshot of the Insight Observatory's Educational Image Request (EIR) Forms for the ATEO telescope network. A couple of examples of classes using the EIR form with the Astronomical Telescope for Education were 5th-grade students at Plymouth South Elementary School and Earth Science students at Plymouth North High School. If you are an educator and interested in using the ATEO Educational Image Request form for your classroom projects, please Contact Us for a free consultation.